Labels and product descriptions, too, can dramatically influence how we perceive the products we consume and, ultimately, how we evaluate that consumption experience. 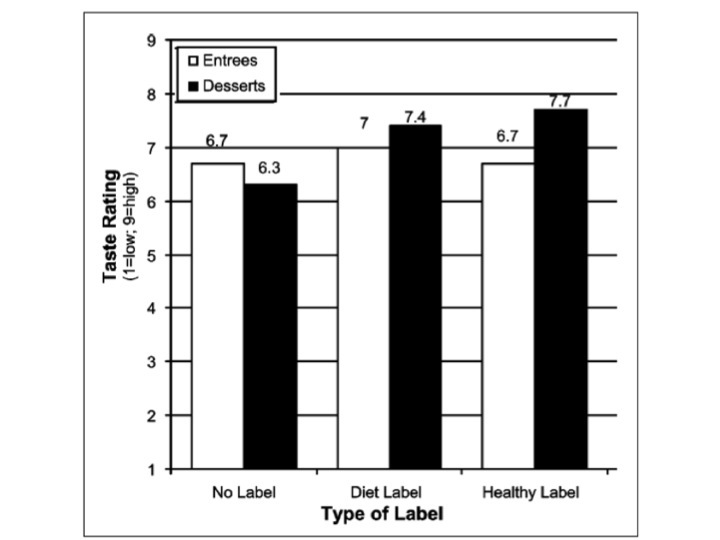 For instance, in an experiment, participants’ sensory evaluation of the selection of entrées and desserts consumed was affected by the inclusion of the labels ‘diet’ or ‘healthy’ (see figure). And what is the role of labels in pre-purchase decisions? If you are adding a descriptor to your low-calorie product, then you might be well advised to ditch ‘diet’ in favour of ‘light’ or, even better, ‘healthy’. This is because the label ‘diet’ suggests deprivation – which may partly explain why not many men drink Diet Coke but embraced Coke Zero. The label ‘light’, in turn, conjures images of a relaxed attitude to life, while the descriptor ‘healthy’ has undertones of overall wellbeing. The same seems to apply in business-to-business interactions. According to Steve Martin, co-author of Yes! 50 Scientifically Proven Ways To Be Persuasive, business proposals made by someone using a professional title such as director or VP will often be perceived as more credible and persuasive than the same proposal made by someone not using such a title — even if they are the same person. In laboratory tests, the label used had a stronger effect in inference tasks than any other particular feature. Not only that, but when participants in the laboratory tests were told the label as well as some information to contradict it, they would still infer features consistent with the label. So, as far as decision making is concerned, it is not necessarily true that ‘a rose by any other name, smells just as nice’. But how do labels work? Labels affect cognitive processes via two mechanisms: perception and conceptualisation. Perceptual filters determine what we actually register among all stimuli that we are exposed to. As observations of professional basketball players reveal, perceptual filters not only influence absorption of the available stimuli, but also drive what people look for in the environment. Conceptual filters, then, extract information-bearing data from what has been registered. If information about a stimulus is incomplete, we tend to use general information about typical category membership to fill in for information not presented. In this sense, labels impose a self-reinforcing bias that leads us, unconsciously, to generate missing information to fulfil an anticipated behaviour or state of affairs. The use of such short cuts plays a critical role in the performance of daily tasks, enabling us to make quick judgements based on little information. Though, it also poses many challenges to marketers, particularly when operating in an international, multi-cultural environment. Names, labels and other descriptors are highly consequential in decision-making, and the process of choosing them should not be taken lightly. Posted on May 7, 2010 July 30, 2012 by anacanhotoPosted in UncategorizedTagged Categories, Cognition, Decision Making, Labels.